November 15, 2018 2:52 pm. Aerolithe will be ridden by Ryan Moore in the weekend’s Grade 1 Mile Championship. Source: Japanese Racing Association. The most anticipated starter in this year’s Japan Cup (G1, 2,400m) on November 25 would be Almond Eye (JPN, F3, by Lord Kanaloa), who is coming off her sweep of the fillies’ Triple Crown—the first in six years and fifth overall. Defeated to second in her two-year-old summer debut, the Lord Kanaloa (JPN, by King Kamehameha) filly has remained undefeated in her following five starts, including an inaugural graded victory in her three-year-old comeback in January, the Shinzan Kinen (G3, 1,600m). The bay filly came off a three-month break for the first of her Triple, the Oka Sho (Japanese 1000 Guineas, G1, 1,600m), where she captured her first G1 title with a terrific late charge from behind. Some were skeptical about her handling the 2,400-meter distance in the Yushun Himba (Japanese Oaks, G1, 2,400m) based on her pedigree—her sire was a sprint champion with five G1 titles at 1,200 meters. Nevertheless, the gifted filly was quick to prove her doubters wrong by effortlessly pulling away from the front group, covering the distance in 2:23.8, the second fastest in the race’s history. Five months later, Almond Eye won the last of her Triple, the Shuka Sho (G1, 2,000m), with yet another powerful charge from behind. She weighed 14kg more than in the Yushun Himba, allowing the possibility of handling another start after her remarkable accomplishment. Trainer Sakae Kunieda confirmed his intention to put her in the Japan Cup, provided only if her physical state is right for the big challenge. If the three-year-old filly claims the Japan Cup title, she would be only the second three-year-old filly, following Gentildonna (JPN, by Deep Impact) in 2012, to win both the Triple Crown and the Japan Cup in the same year. Among those who ran in the Tenno Sho (Autumn) (G1, 2,000m) on October 28, winner Rey de Oro (JPN, C4, by King Kamehameha) was another potential Japan Cup runner with high expectations this year. Following his derby victory in the 2017 Tokyo Yushun (Japanese Derby, G1, 2,400m), he turned in a runner-up effort against his seniors in the Japan Cup last year. With regular rider Christophe Lemaire having already been booked to ride his other partner, Almond Eye, Rey de Oro’s connections have chosen the Arima Kinen (G1, 2,500m) on December 23 as his next destination. Connections of Tenno Sho (Autumn) runner-up Sungrazer (JPN, C4, by Deep Impact) and fourth-place finisher Al Ain (JPN, C4, by Deep Impact) have already announced their plans to head to the Hong Kong Cup (G1, 2,000m) on December 9 and the Mile Championship (G1, 1,600m) on November 18, respectively, instead of the Japan Cup. Tenno Sho (Autumn) third-place finisher Kiseki (JPN, C4, by Rulership) appears to be back on a positive path after a prolonged slump. He won the 2017 Kikuka Sho (Japanese St. Leger, G1, 3,000m) but was badly affected by the effort over an unprecedentedly heavy track. The talented colt showed signs of bouncing back this fall with a third in the Mainichi Okan (G2, 1,800m) and then validated his form in the Tenno Sho. If he is able to secure a good position early and make use of his stamina over 2,400 meters, he has a good chance to finish well at the Japan Cup. Coming in fifth in the Tenno Sho (Autumn) was Mikki Rocket (JPN, H5, by King Kamehameha), who claimed his first G1 title in the Takarazuka Kinen (G1, 2,200m) in June by out-dueling Hong Kong’s former Horse of the Year Werther (NZ, G7, by Tavistock) for a well-deserved victory, even though the race did not include the best of JRA’s turf runners. Despite a prolonged four-month break, the son of King Kamehameha (JPN, by Kingmambo) then made an impressive effort in the Tenno Sho by crossing the wire just 0.4 second behind winner Rey de Oro. He might improve on this in his second time out this fall. Tenno Sho (Autumn) race favorite Suave Richard (JPN, C4, by Heart’s Cry) finished a disappointing tenth after missing his break, getting bumped on his left and then being pinched back. Having to race in the rear, he failed to be a factor in the race and was well beaten by 1.5 seconds. However, he turned in impressive performances beginning with his runner-up effort in the Tokyo Yushun last year, which he followed with a victory against older horses in the Copa Republica Argentina (G2, 2,500m), both at Tokyo Racecourse where the Japan Cup will be held. He then scored his first G1 victory in the Osaka Hai (2000m) in April this year. The Heart’s Cry (JPN, by Sunday Silence) colt has every chance of doing well if the Japan Cup proceeds smoothly. Some of the key runners will be coming off starts in the Kyoto Daishoten (G2, 2,400m) on October 8. Victor Satono Diamond (JPN, H5, by Deep Impact), the leader of the five-year-old generation, won both the Kikuka Sho and the Arima Kinen as a three-year-old, but then experienced a downturn after being defeated to third in the Tenno Sho (Spring) (G1, 3,200m) in April last year. He was unsuccessful in France, where he was heavily beaten in both the Prix Foy (G2, 2,400m) and the Prix de l’Arc de Triomphe (G1, 2,400m), and then remained below form this spring, finishing third, seventh and sixth in three starts. He finally put a stop to his losing streak at six by claiming the Kyoto Daishoten. He will be facing tougher competition in the Japan Cup, so his true ability will be put to the test. The 2017 Japan Cup champion Cheval Grand (JPN, H6, by Heart’s Cry) will attempt to defend his title coming off a fourth-place finish in the Kyoto Daishoten. Under the skillful hands of Hugh Bowman, the son of Heart’s Cry validated his Japan Cup win by overcoming disadvantages to finish third in his next outing, the Arima Kinen. He disappointed to 13th in his 2018 comeback, the Osaka Hai, but in the Tenno Sho (Spring) he made an early move and missed by just a neck. In the Kyoto Daishoten, although he carried a kilo more than the eventual winner, there is concern about his inability, without any apparent excuse, to hold off the second and third-place finishers, who were below his rank. The hope is that he will improve on this second start of his fall season. The Copa Republica Argentina was held on November 4 and won by Perform a Promise (JPN, H6, by Stay Gold) this year. Past winners of this race have subsequently become G1 winners—2008 winner Screen Hero (JPN, by Grass Wonder) claimed the Japan Cup that year; 2010 winner Tosen Jordan (JPN, by Jungle Pocket) won the Tenno Sho (Autumn) and was runner-up in the Japan Cup in the following year; Gold Actor (JPN, by Screen Hero) won in 2015 and claimed that year’s Arima Kinen; 2016 winner Cheval Grand was the 2017 Japan Cup victor; and last year’s winner Suave Richard took the 2018 Osaka Hai. Perform a Promise, the son of Stay Gold (JPN, by Sunday Silence) and third favorite in this G2 race, was rated off the rails in mid-field and exerted a good turn of speed to tag the leader 100 meters out for a 3/4-length victory. It was his second grade-race title, after the Nikkei Shinshun Hai (G2, 2,400m), and gave Irish jockey Colm O’Donoghue, who rode under JRA’s short-term license, his first grade-race victory in Japan. 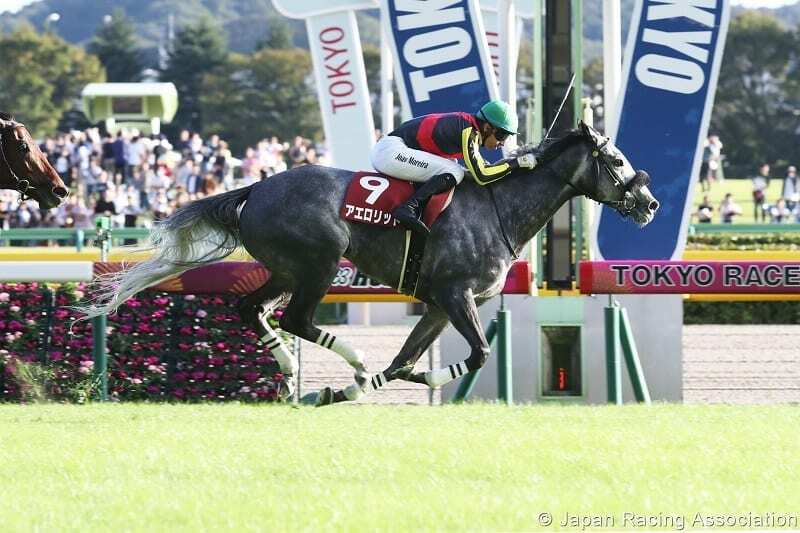 Perform a Promise will pass up the Japan Cup, however, to focus on the Arima Kinen in December. The Japanese entries also include 2016 Hong Kong Vase (G1, 2,400m) and 2017 Takarazuka Kinen champion Satono Crown (JPN, H6, by Marju), 2016 Japan Cup runner-up Sounds of Earth (JPN, H7, by Neo Universe), 2016 Tokyo Yushun victor Makahiki (JPN, H5, by Deep Impact), 2018 Nikkei Sho (G2, 2,500m) champ Ganko (JPN, H5, by Nakayama Festa), 2018 Meguro Kinen (G2, 2,500m) winner Win Tenderness (JPN, H5, by Company), 2018 Takarazuka Kinen third-place finisher Noble Mars (JPN, H5, by Jungle Pocket) and 2017 St. Lite Kinen victor Mikki Swallow (JPN, C4, by Tosen Homareboshi). Happy Grin (JPN, C3, by Lohengrin), who has three wins and three thirds out of nine starts, all on turf, but is coming off an 11th-place finish in the Fuji Stakes (G3, 1,800m), also will run in this year’s Japan Cup as a representative of NAR (National Association of Racing; local public racing). Meanwhile, two foreign runners have accepted their invitations to run in the 2018 Japan Cup. Capri (IRE, C4, by Galileo) from Ireland won both the 2017 Irish Derby (G1, 2,400m) and St. Leger (G1, 2,900m) and finished a valuable fifth in this year’s Prix de l’Arc de Triomphe. Thundering Blue (USA, G5, by Exchange Rate) from Great Britain, winner of the York Stakes (G2, 2,050m), finished third and second in the International Stakes (G1, 2,050m) and the Canadian International (G1, 2,400m), respectively.